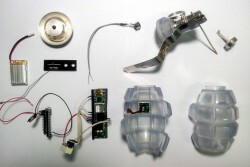 The Transparency Grenade is equipped with a miniature computer, a microphone and a powerful cordless antenna. When it is active, it intercepts the traffic circulating around it on targeted Wi-Fi networks along with ambient noise. It streams this data in an anonymous and secure fashion to a server dedicated to providing access to this information. Names of users, usernames for networked devices, IP addresses, unencrypted email fragments, webpages, images and voices are retrieved and instantly revealed in public on the screen. 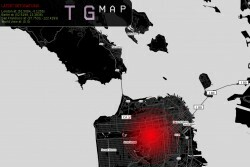 A red dot on the map indicates the location of the detonation. Through this symbolic artifact, Julian Oliver critiques the lack of transparency of information circulated by governments and companies. He critiques the withholding and the control of practical information by these entities and advocates for freedom of information at a time when whistleblowers are always condemned. 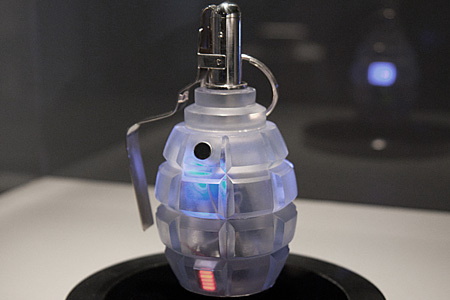 The grenade is presented here as the symbol of a passing to action. It is an immaterial explosion that is produced, without physical violence, publicly dispersing fragments of information. Beyond political demands, the work also raises awareness among the public about the need to protect personal data, often intercepted and used for commercial ends or for espionage. Seeing photos, the sites visited, the fragments of emails instantly displayed before everyone’s eyes on the big screen, the visitor becomes conscious of the ease of intrusion into our private virtual space. Julian Oliver (1984-) is an artist from New Zealand who defines himself as a “critical engineer.” His works, internationally recognized, use engineering and computer code as the central materials of creation, exploring their potentiality as much as denouncing their by-products. He also speaks at numerous workshops and conferences, particularly on software art, creative hacking, networks, object-oriented programming for artists, etc. An activist, he defends free and open source software and contributes to initiatives aiming to reinforce civil rights on the Internet.